....Irene Vernon, a Colorado State University professor and chairwoman of the ethnic studies department, said the message on the billboard is taking a narrow view of a much more complicated history of the Native American plight. She said it's not as if Native Americans just gave up their guns and wound up on reservations. It isn't just about gun now either, you idiot. First off, how can she claim to be a Native American? Is it just because she was born here? That makes a lot of people that. As far as is known, none of the Indian tribes who exist now are truly "native". All can be traced to Asia. Now instead of ethnic studies, maybe should study history. Then she would understand what the billboards mean. Fine... maybe we should show a bunch of Chinese people instead and have Mao Tse Tung be quoted as saying, "I'll take care of you".... or maybe we can have a bunch of Jews, Catholics, etc. there and have Hitler say "I'll take care of you". 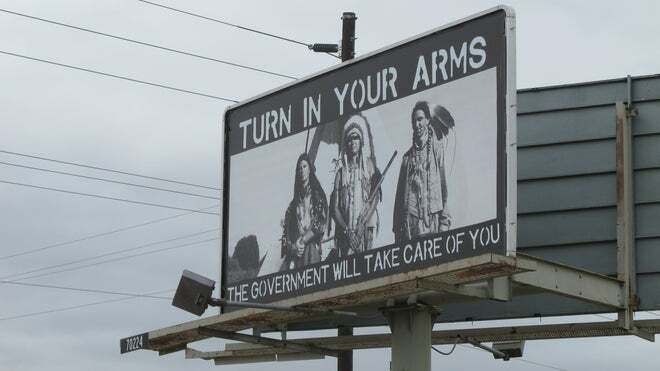 The fact is, this government did tell the Tribes to disarm and this government did massacre many of them. This government has never been squeamish about killing people that got in their way. Remember Kent State? So a couple of people complain and that constitutes Native Americans incensed? That's painting with an awful wide brush. So the professor want's the names of the people that put it up? Is that so she and her liberal buddies can ridicule them for expressing their first amendment rights? How dare these anonymous people offend anyone, especially liberals. Just because it is offensive ( that it occurred ) does not negate the fact it happened and is now happening to more peoples. My first question to those truly offended by the sign woudl be what is the more offensive thing that it happened to you're people so many years ago or that it is happening to all us us now? Easiest way to offend a Liberal, show/tell them the facts. It irritates the heck out of them when they think they know it all and are shown to be wrong. The fact that she is a college professor tells the whole story. The fact that she is a Denver area college professor tells the whole story. Good for her, I'm part native American and am not offended so tell her to keep her opinions to herself. Yes it was about more than guns but it started with disarming our ancestors!!! Then they moved them, murdered them, bottom line it was guns first!! !